I just wanted to run with someone. That's how it all started. 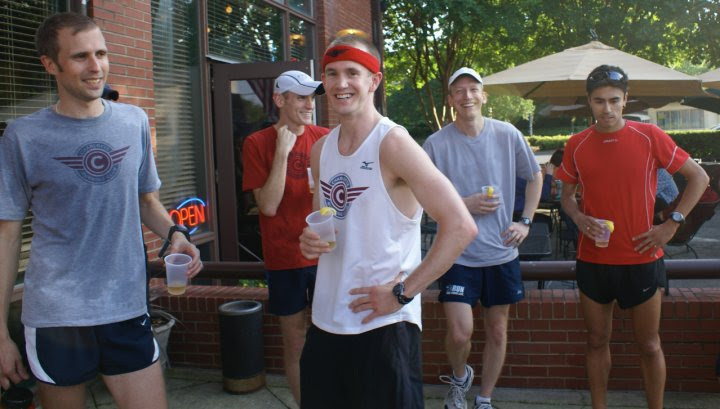 In 2009, I was getting back into running. Running 6-7 days a week for 45min to an hour by yourself can get lonely. I wanted to have someone to talk to and push me on harder days. I had looked around online, checked with some of the local running stores and frankly, was having trouble locating a regular group to run with each week. 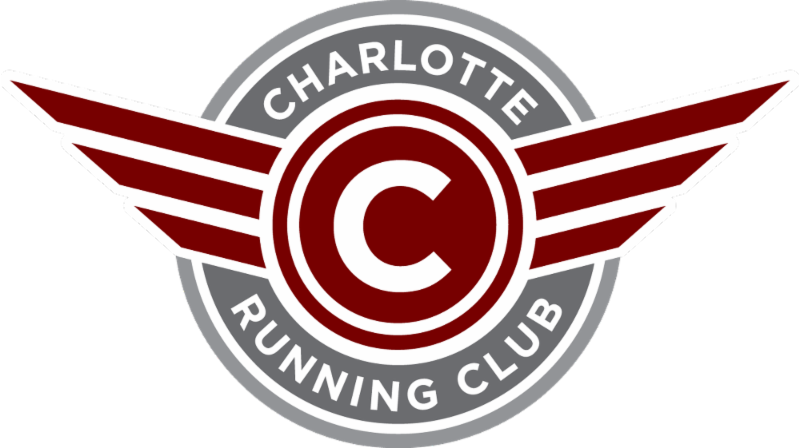 There were some running clubs that had come and gone in the Charlotte area but none of them were that stable or really even that unified. I turned to craigslist of all places. I went searching on a whim to see if anyone else was looking for someone to run with in Charlotte. I acknowledge this is creepy especially for a married man with a child. I can't remember if I posted or found a post but Caitlin Chrisman and I met after work for the first time in front of Discovery Place and went on a run. Caitlin had just recently graduated from Wake Forest where she had a terrific academic and running career for the Deacons. She had started a job with Bank of America and decided post college she was going to move up distances and give the half marathon a try at Outer Banks. I was training for Marine Corps Marathon. Prior to us meeting up, we exchanged some emails to re-assure each other we were not ax murderers and we both did appropriate online stalking to sufficiently learn about the other prior to the meet up. rule was that if she got off of work before 1:30am (I am not making this up), she would run with us at 6:00am. 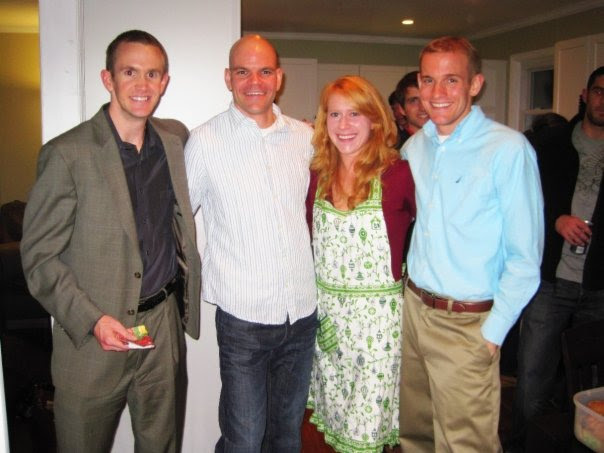 Matt Jaskot found us too as did Kylee Schuler, Chris Lamperski and Paul Mainwaring. We got to talking about how we see all these runners at races but none of us regularly train together. 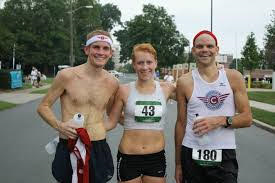 Wouldn't it be cool if we had a club where we could link each of us up and in general support running in our community? So the very first "club" was "What's My Age Again". A Blink 182 song for those that did not catch on. We had no artistic ability so I used my tatoo which I had recently got, a Monkey running. I think we had this name maybe for a week or two until we collectively agreed on Charlotte Running Club. I pieced together a website and we started to get a few more folks however, we did not have a real logo yet. 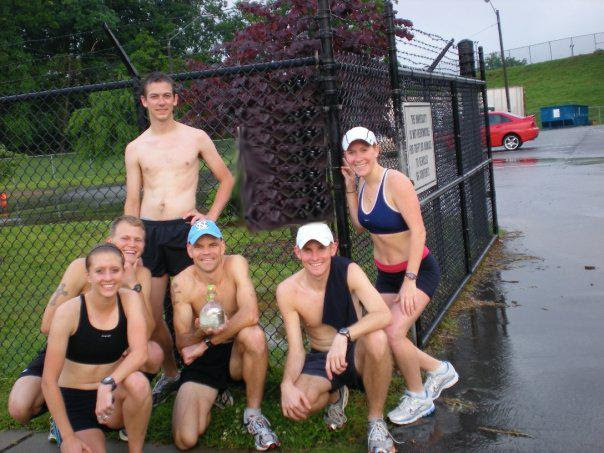 In the early days, there were about 50-100 runners who fairly quickly joined us and were huge champions of the club. I started to list them all but there really are too many and I fear I would miss someone. Except for those that have moved out of the area, I think all are still active members today. At some point very shortly after, I met Chris Bradle. Chris has excellent graphic skills and he volunteered for free to create a logo. He went thru a couple versions that he showed us but pretty quickly we landed on the logo we have today. About a year later, we were doing most of our interval workouts down at the JSCU track. It's a wonderful facility that is jointly owned by the county park and the school. So during non-JCSU sports, it is open to the public. It was May 5th and I got this crazy idea that after we finished our 400m workout, we would all take a shot of tequila to celebrate our club 1 year anniversary. We started the workout after a good warm-up and about half way thru a monstrous thunderstorm rolled thru. Here we are running in thunder and lighting exposed on a track with rain practically coming sideways and the one side of the track is literally starting to flood. However being stubborn runners, we wanted to finish the workout! We got to the 12 400m and stopped, each took a shot and then ran a hard last 400m in the pouring rain. In the early years, Caitlin, Jay and I appointed ourselves to our own Board of Directors. We created Bylaws and started to recruit runners where we could. We recruited additional board members and began having regular board meetings per our bylaws. We realized that the monthly meetings were not enough and we should take a retreat with the board to really allocate a full day to sinking into who we are as a club and what we want to be. We of course found a race (Hot Chocolate 10k), all ran it, and then had our meeting! I bring this meeting up only because I think it was a pivotal moment in our club history. Scott Helms in particular was awesome. Scott was the only one who had been a board member of an organization outside our club. The rest of us were making it up. Scott challenged a lot of what we were doing. It got heated but stayed healthy dialogue. As an output, we made numerous changes about how we should and wanted to view the running community. We created a 2 year plan to formalize more like a real organization and put in processes to grow the club. The club continued to grow over the years but it was still the baby of the 3 founders, Aaron, Caitlin and Jay. For the club to sustain into the future, we knew that it had to exist without our daily involvement. Jay was the first to move away so this was a really good test to see how the club did without his endless devotion to club activities. Jay was very much missed but the club kept on ticking. Bill Shires was our next president which was another opportunity for a founder (Aaron Linz) to step down and hand over the leadership to someone else. Caitlin had also stepped away as a board member at this time. The club has thrived and we are now on our 5th president! Speaking on behalf of myself, Caitlin and Jay, as founders, we are so enormously proud of the club and it's future. Caitlin, a two time marathon olympic trials qualifier now lives on the West Coast but always catches us for runs when she is in town for work with Bank of America. Jay left his broadcasting career in New York City to become the Marketing Executive of the Atlanta Track Club. Yes, from the humble beginnings of a startup running club to a senior leadership paid job at the 2nd largest running club in America! Last, thank you to all over the years who have supported our club by running, helping at events, supporting us as a vendor and/or just sharing a good word or even challenging who we are to help us improve. The club was never intended to be exclusive. We exist to support running in our community which can take on so many different forms. One of the biggest lessons I got out of starting the club and being involved was to dramatically expand my previous tunnel vision of what it means to be a runner. A runner is basically anyone who gets out the door and take a few steps. At the end of the day, whether you run 10 steps or 10 miles, you are exercising. Thank you Charlotte Running Club and I look forward to many, many more successful years!! !